The tricycle, at the UWM Engineering Makerspace. Alissa Shortreed prepares to ride, at the weekend competition. Anthony Pierson (on tricycle) prepares to ride, at last weekend's event. Anthony Pierson rides, during the weekend event. 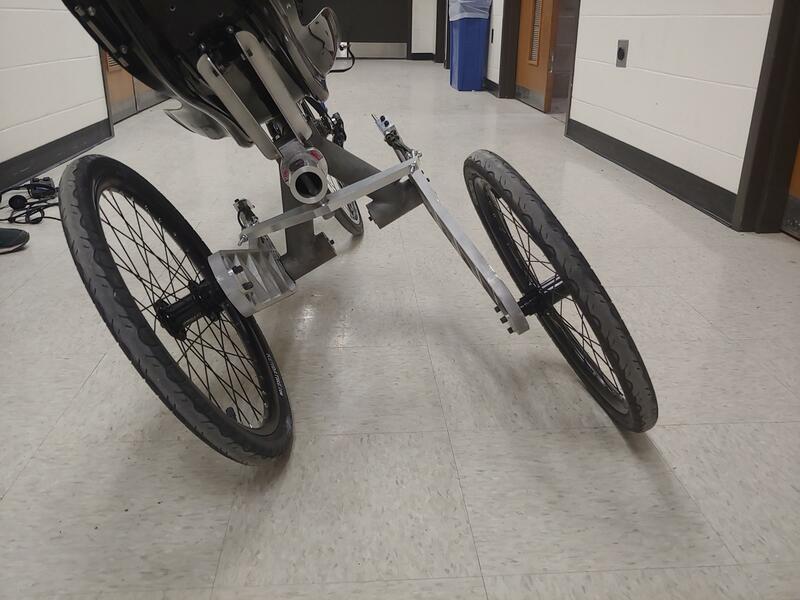 Chuck Quirmbach reports on the narrow-track, recumbent tricycle built at UWM. Some engineering students strive to design a faster or more fuel efficient car. But not at UWM’s Bicycle and Motorcycle Engineering Research Laboratory. The lab, started a few years ago within the Department of Mechanical Engineering, tests bicycle tires and works with motorcycle parts. It also has a team that's been building a human-powered, recumbent three-wheeler. Since it's a recumbent, the rider's feet are roughly at the same height as his or her head. The bike has one, standard-looking wheel in front, with the pedals above it, and two smaller wheels in back, a little ways under the rider's neck. But Anthony Pierson, a student who helped design the bike, says in many ways, it's a plain-old bike. "It does every bike thing you want a bike to do. So, it sounds like a bike. It rides just like a bike," Pierson says. Anthony Pierson (on tricycle), Andrew Dressel and Alissa Shortreed, with the recumbent tricycle at UWM. That's partly because Pierson and his colleagues are trying to do something different than you would normally find at the back end of a three-wheeler. There's a pivoting lever called a bell crank that helps connect the rear wheels. The bell crank can be set for unstable or stable positions, according to the students' adviser and mechanical engineering lecturer Andrew Dressel. An illustration of a basic bell crank. "You'd want it to be stable. So, it's like sitting in a chair, when you're going real slow. Or when you're stopped, so you don't have to put your feet down," Dressel explains. Dressel says the unstable position allows for faster riding and leaning into a curve or turn, much the way you'd do on a bicycle. He says the narrow track — meaning the back wheels are 18 inches closer together than normal — allows those wheels to tilt, instead of the tipping over that might occur on a more standard tricycle. The back wheels of the tricycle tilt, when in "unstable" position. With some older riders ditching more traditional upright bikes because of back pain and other concerns, Dressel says he had someone in mind when he thought of the concept. "When it occurred to me we could combine all these things in one, I thought, 'Maybe there's something we can get my mom to ride,' " he says. Dressel's mother is 79 years old. Like many engineering efforts, there are several people involved. Student Phillip Van Asten used to manage a bike shop service department and was recruited for the project. "They recruited me in part, I think, because of my ability to handle the conventional bike aspects. A lot of this is very novel. But it does incorporate a lot of stock bike parts, and part of my role is helping fit all that together," he explains. (From left) Anthony Pierson, Andrew Dressel, Brad Carstens and Alissa Shortreed with the tricycle. Van Asten also got a bicycle company to donate the recumbent tricycle's front end. Engineering student Brad Carstens says his role has been the question-asker, including when Pierson was using a computer to design the bike. "You know, I would sit down with him and ask him, 'Why are you putting it this way? What's happening with this?' " Carstens says. He adds, "One, it helped me gain knowledge of what's going on with our bike. Two, I think it also possibly benefited Anthony as he was designing to help explain his reasoning." Engineering student Alissa Shortreed says she's been the organizer, helping everyone communicate. That includes describing the tricycle to people who aren't engineers. She says it's not just older riders who are interested in innovative bike design. "I know a lot of my friends are bikers. It's not something I realized right away, but now that I have been exposed to it, I realize there is a big importance and a big draw to having this product," Shorteed says. Tim Wegehaupt of the UWM team rides the recumbent tricycle at the weekend competition at Michigan State University. 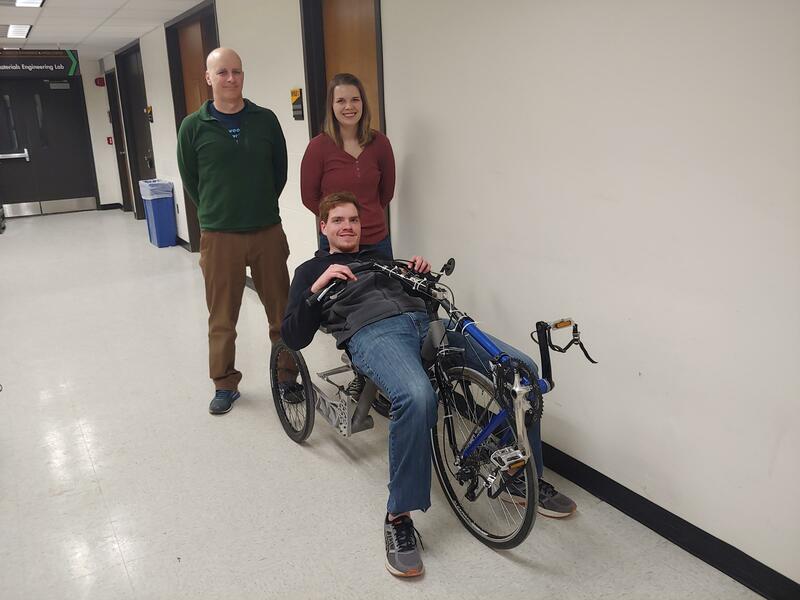 The UWM team took their narrow-track recumbent tricycle to a human-powered vehicle competition last weekend at an engineering festival at Michigan State University. Andrew Dressel reports UWM overall finished 15th of 43 competing teams. 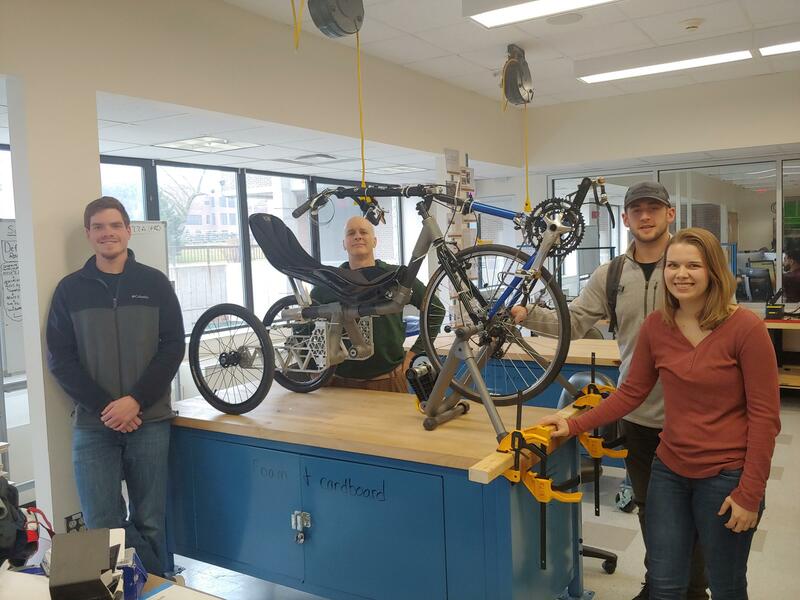 Next, the UWM team will work on installing a switch, so the rider can more quickly go back and forth between the stable, and unstable rear-wheel settings. But the young inventors and their advisor are confident enough of success — they already submitted a provisional patent. Biking in the City: What Would Get You To Ride More? Helen Pidd, an editor for The Guardian, recently looked into why so few women feel comfortable riding bikes in cities. Her theory: They think it is dangerous. For the most part, Wisconsin Bicycle Federation's Jessica Wineberg agrees. Two Milwaukee neighborhoods may become more connected to the city in the coming months with the help of multi-use trails. The new trails were recommended by Rails-to-Trails Conservancy, a nonprofit organization that transforms unused rail corridors into walking and bike trails.